Four years ago, Andy Sims took over Blue Valley North, a program that was 1-26 the three previous seasons. In his first summer, Sims was in final preparations for his first team camp when he made an alarming discovery. Blue Valley North was short around 20 chin straps. He called the sporting goods company, which said they could get the straps to Sims the following day. Sims needed the straps that day. He called around to then-Blue Valley West coach Scott Wright, and then-Blue Valley coach Eric Driskell. The coaches didn’t know Sims, who played and coached at the University of Central Missouri and spent the bulk of his career coaching in Missouri. Wright offered five to 10 chin straps but couldn’t fulfill the full order of straps. Driskell, like Wright, was a little surprised at the request. However, he quickly agreed to help Sims. “That just kind of shows you what the guy was really about,” Sims recalled Monday night. This fall, Blue Valley North was one of many state championship schools that had a link this fall to Driskell, a well-respected and highly successful coach. Driskell passed away suddenly in the offseason, a death that reverberated through the state. Driskell went 70-17 at Blue Valley with state crowns in ’10 and ’13 and runner-up showings in ’15 and ’16. “Eric’s one of those guys who was obviously very competitive, but at the same time, he is just like, ‘If you need help, just come on over,’” Sims said. Sims went 2-7 in his first year and 8-2 in a 2015 season that yielded a 28-27 victory against Blue Valley and share of the Eastern Kansas League title. In ’16, the Mustangs fell to Driskell’s Tigers in the playoffs. In Week 3 this season, Blue Valley North surrendered a big lead to Blue Valley, had a critical penalty late and lost in the final seconds, 34-33. Playing in a close game was a new experience for the current group of Mustangs. “My boys just melted down,” Sims said. In the Class 6A semifinals, Blue Valley North again matched up with Blue Valley. The Tigers were 13-2 all-time in state semifinals, including a 5-0 mark in Driskell’s head coaching tenure. The Mustangs had never reached a state title game and had just one previous semifinal appearance, in ’03. Blue Valley North, behind a stellar effort from junior quarterback Graham Mertz, a Wisconsin commit, defeated Blue Valley, 44-37, in double overtime on the road. Sims believed the Mustangs never had a single turnover in the playoffs and limited penalty yards. “That’s really, really stood out to me, and I think Eric’s teams always kind of had something similar,” Sims said. In the state championship game, Mertz, one of many electrifying signal callers on state title and runner-up squads, delivered a seminal performance with 462 passing yards. He rushed for the game-winning touchdown with 57 seconds left as the Mustangs defeated two-time defending state champion Derby, 49-42. Mertz, a first-year transfer from Bishop Miege, led a prolific offense with 3,684 passing yards and 45 passing scores. Senior Grant Hamel recorded 700 rushing and 500 receiving for a squad that rushed for 2,500 yards. Five receivers exceeded 300 yards. Senior running back Tony Bragulla rushed for 800 yards. In Week 3, senior wide receiver Vencent Allen broke his collarbone and didn’t return until the semifinals. His good friend, senior Nijel Roberts, took his place. 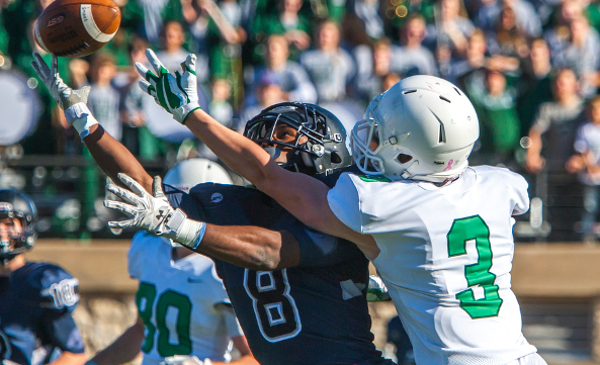 Roberts, whom Sims called the team’s biggest surprise, and senior tight end Dylan Freberg exceeded 1,000 receiving yards. Freberg tallied more than 220 receiving yards in the state finale. Sims, a former collegiate linebacker and longtime defensive coach, started to take over the offense once he began coaching in high school. At Central Missouri, he played and coached under Willie Fritz, now the Tulane head coach. Fritz left UCM in ’09 after 97 victories and then enjoyed successful stints at Sam Houston State and Georgia Southern. Around a decade ago, Sims talked to his wife about high school or college coaching. After a while, Sims realized high school was where he was supposed to be. He changed his “end game.” In Sims’ eyes, for college coaches, it’s all about the next job. For high school, Sims focused on giving kids “the best high school experience.” In his first season, Blue Valley North won two games; Sims called it one of the happiest teams he’s ever seen. Blue Valley North (9-4) became the second team in Kansas history to win a state title with fewer than 10 wins, joining league counterpart Mill Valley. The Jaguars finished 9-4 last season to win the Class 5A title. Blue Valley North’s offense jumped from 25.8 points a game last year to 38.1 this fall. Sims said for most squads, the coaches have to make the players believe they can win. Blue Valley North had the opposite. After a 1-3 start and 4-4 regular season, the Mustangs went 5-0 in the playoffs. That included a comeback 48-30 versus Olathe East in the second round and a big 45-10 victory versus Shawnee Mission East in the quarterfinals. Shawnee Mission East was ranked in the top-3 all year. To counteract the Lancers’ flexbone, Sims changed from a three-man front on defense to four-man front. Sims platooned in the regular season and asked multiple linemen to play both ways versus Shawnee Mission East, including senior Nick Orr and junior Jack Stollard. “We’ve got to play Blue Valley, and that was kind of their motivation, I guess,” Sims said. In Class 5A, Bishop Carroll, like Blue Valley North, entered the season as a top-5 team after a seven-win season in ’16. Additionally, the Golden Eagles weren’t considered the classification favorite as Goddard and St. Thomas Aquinas led the poll all fall. Bishop Carroll, led by standout senior quarterback Braden Howell, defeated Goddard (29-17) in the semifinals and held off Aquinas (38-28) in the 5A title game. It marked a championship for first-year coach Dusty Trail, an assistant and offensive coordinator since 1995 with Bishop Carroll. Trail became the first, first-year head coach to win a football championship since Driskell in 2010. At that time, Driskell, a Blue Valley graduate, had previously served as offensive line coach for 14 years before he took over for Steve Rampy. Bishop Carroll won its third state title in the last six seasons. Trail remained as offensive coordinator this season but expects to relinquish the title to some younger assistants in the not-so-distant future. Longtime defensive coordinator Jim Nance remained in his role and led a change from Bishop Carroll’s traditional 4-3 look to a 4-2-5 defense to better attack spread offenses. This season, three first-year head coaches went to state title games. In Class 4A, Division I, former Andale assistant Dylan Schmidt led his alma mater to a runner-up showing behind Bishop Miege. In Class 2-1A, Shawn Seematter replaced legendary coach Chuck Smith and helped St. Mary’s Colgan to a second-place finish behind Smith Center. From 2011-16, first-year head coaches at a new school went 0-5 in title games. This season yielded the first time since 2014 that a first-year coach led a squad to a victory in a state finale. While Carroll, Andale and Colgan are established powers, all three coaches led a marked improvement. In ’16, Carroll and Andale lost in the first round for the first time since ’04. Colgan reached its first final since ’10 and only second in the last decade. Carroll, like Blue Valley North, went through multiple injuries. Standout junior tight end Clay Cundiff, a Division I prospect with a Kansas offer, missed time with injury. Senior running back Desmond Smith was out for the year after a midseason injury. Trail said Carroll started a different offensive line combination virtually every game. The defensive line had injuries. Chris Lugo was hurt in early season and senior Luke Evans missed a couple of games. Senior free safety Jacob Buchanan was out briefly. Senior middle linebacker Riggs Robben (119 tackles) was the team’s anchor. Howell was the team’s only healthy quarterback in the playoff stretch run as Carroll’s three other signal callers had suffered injury. He accounted for 3,086 passing yards with 33 passing scores and 708 rushing yards. Trail believes no quarterback in his tenure had delivered as much total offense in one season. Carroll has enjoyed a string of prolific quarterbacks in recent seasons, including Blake Bell (Oklahoma, now in the NFL), Zeke Palmer (Washburn) and Howell’s brother, Colton, now playing at Northern Iowa. In the playoffs, Trail believed Bishop Carroll had to use Howell more often in the run game, a proposition that made him “very, very nervous” because of little backup help. In the Goddard victory, Howell rushed 22 times for 172 yards. Junior running back Jackson Nichols assisted with the carries. At wide receiver, seniors Thomas Helten (64 catches, 1,044 yards and 11 scores) and Joseph Holthusen emerged as big play threats. Holthusen missed some time, too, though went over 100 receiving yards in a playoff win versus Maize. Helten finished with 13 catches for 187 yards and a score in the state title. Carroll opened the year with a 40-35 road win against Wichita Northwest when the Golden Eagles scored in the final seconds to win. Northwest eventually reached the 6A semifinals. Bishop Miege cruised to its fourth straight 4A-I state championship and third with senior Carter Putz as the starting quarterback. He set Kansas passing records for career yards and single season and career touchdown passes. When asked about differences between 2017 and the last three years, coach Jon Holmes immediately pointed to Week 1. Like Carroll, Miege had a hallmark victory. In that contest, Miege defeated Blue Valley, 55-10, the Tigers’ first game without Driskell on the sidelines in more than two decades. Miege is 50-2 in the last four years with season-opening losses to Blue Valley in ’15 and ’16. Like Mertz, Howell and Putz, Kansas yielded many top signal callers. Marysville senior Jack Blumer greatly improved on a breakout junior season. He helped the Bulldogs to a surprise 3A state runner-up finish. Blumer completed 189 of 273 (69 percent) for 2,940 yards and 30 scores for coach Dustin Heuer. In Eight-Man, Division II, Hanover reached its fourth straight eight-man title game and won its second consecutive championship. The Wildcats held off Hodgeman County, 54-48, in the highest scoring eight-man title game in state annals, according to Prep Power Index archives. Hanover graduated Will Bruna last season (eight-man record holder in multiple passing statistics) yet still improved its passing efficiency and overall yards per play. The Wildcats averaged 9.8 yards per play, the highest of the last four years. Under veteran coach Matt Heuer, Dustin’s brother, junior quarterback Daiken Stallbaumer completed 48 of 71 passes for 1,018 yards with 16/1 TD/INT ratio. Hanover recorded a 143.5 passing efficiency, best under Heuer. In ’15, Hanover had a 143 passing efficiency with Bruna and recorded a 136 last year. After the semifinals, Heuer said Hanover “probably wouldn’t be” playing for state without its passing attack. Stallbaumer threw for a career-high 232 passing yards in the final.